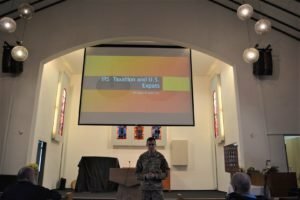 A town hall designed for military retirees and active duty members transitioning into retirement took place on Panzer Kaserne, March 27. The event, hosted by the USAG Retiree Council, focused on potential U.S. and German tax laws, and TRICARE coverage options. Capt. 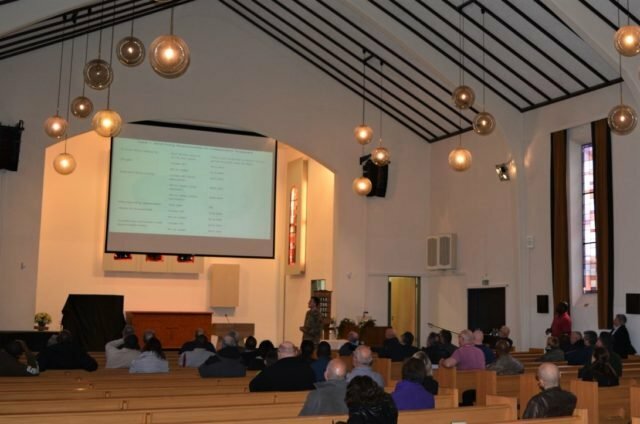 Robert Duffie, SLC, briefs retirees and family members congregated in Panzer Chapel on taxes, March 27. Capt. Robert W. Duffie, Stuttgart Law Center, gave a presentation on IRS taxation and expats overseas, noting that a U.S. citizen’s worldwide income is subject to taxation by the IRS. Additional subjects included handling taxation involving foreign spouses, earned income exclusions, tax credits, residency rules and social security. and the German Tax Authority. Schafer detailed specifics of the Status of Forces Agreement for those transitioning to certain supported civilian or contract opportunities in Germany and the applicability of German income tax exemptions. Other topics of interest included U.S. government retirement payments, marriage and residency. In addition to taxes, healthcare plan questions and answers were provided by Girlie Gaelon, TRICARE beneficiary representative, Stuttgart Health Clinic. “As service members approach retirement from active duty service, they will have some important decisions to make regarding healthcare coverage,” Gaelon said. Types of coverage: Prime and Point of Service care, U.S. Family Health Plan, care for young adults, overseas programs, Tricare For Life. For the latest Tricare information on transitioning from Active Duty to retirement visit www.tricare.mil/briefings. Briefings are continuously updated as benefit changes occur. TRICARE Resources: Visit www.tricare.mil/publications to view, print, or download copies of TRICARE educational materials. Suggested resources include: Transitioning from Active Duty brochure and TRICARE Plans overview. Stuttgart’s Retirement Services Officer Augustus Norvel concluded the event giving thanks to all speakers and retirees that took time out of their schedule to attend the town hall meeting. The presentation concluded with the quote by Benjamin Franklin, “In this world nothing can be said to be certain, except death and taxes,” enforcing the message the from legal center strongly advising personnel not to get into stuck with unpaid taxes and penalties. 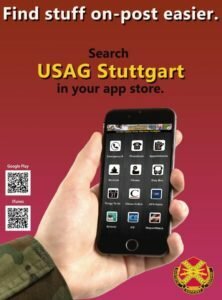 Those interested in becoming a member of the USAG Stuttgart Retiree Council can email, or call 431-2010 or 07031-15-2010. Service members may also stop by Army Community Service, Bldg. 2915, Panzer Kaserne, for transition assistance information.